The map is an update from a previous version that also included the Eastside. However, there is, regrettably, not very much frequent service on the Eastside that runs most of the day. 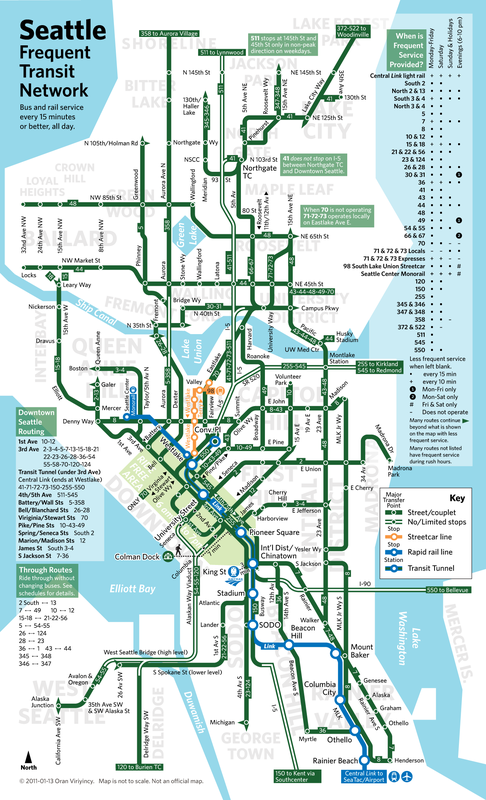 The bulk of such service is during rush hour, and is dominated by hub-and-spoke routes with downtown Seattle at the hub. Service falls off sharply after about 8:30 p.m. and, incredibly, there are no buses at all after about 11:30 p.m. on the Eastside, or that connect it to Seattle, even on weekends. Public transit is a necessary public good that provides multiple benefits. Ridership has increased, fares keep going up, and service is under constant threat of curtailment. It is too bad that budget pressures are forcing service reduction and encouraging more car use, costing more for commuters, road maintenance, parking, and our region as a whole. But then, we do not have one of the smartest regions for transportation.